I came across this error when I was attempting to import data from an Excel spreadsheet into a SQL database using SQL Server Integration Services (SSIS) 2005. The error occurs because by default the Excel driver only reads the first eight rows of the spreadsheet when it determines the column data type and data length. See here for more details http://technet.microsoft.com/en-us/library/ms141683(v=sql.90).aspx. This entry was posted in SQL Server and tagged excel spreadsheet, microsoft jet on April 12, 2012 by richardstk. As part of an operating system deployment task in System Center Configuration Manager 2007 R2 (SCCM), I needed to enable the .NET Framework 3.5.1 Feature on Windows Server 2008 R2. I thought it would be easy to do this as part of the task sequence, but it proved trickier than I expected. I added a “Run Command Line” step and entered the command “Dism.exe /online /Enable-Feature /FeatureName:NetFx3 /LogPath:c:\Dism.log”. On its own this isn’t enough for the feature to be enabled. you must also tick the “Disable 64-bit file system redirection” in order for the feature to be enabled. 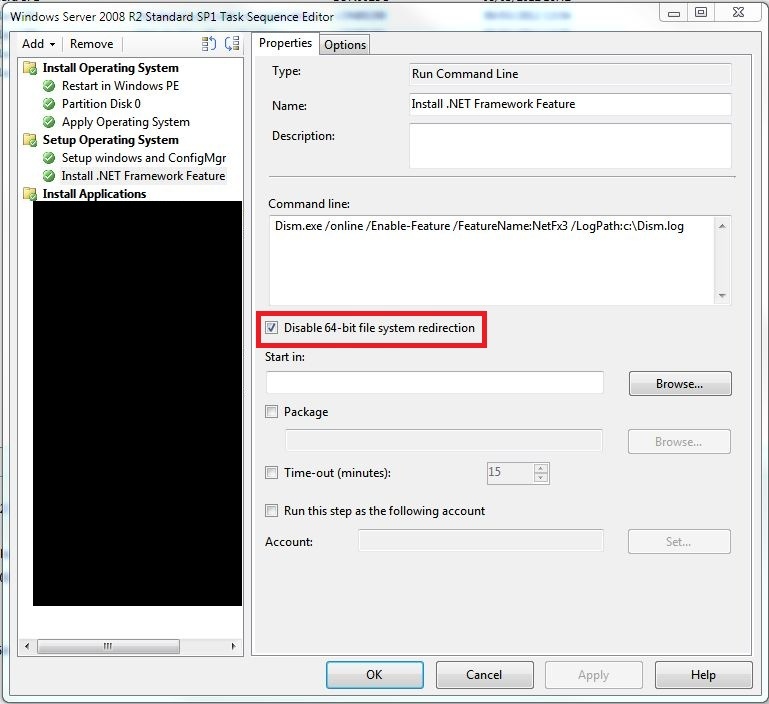 This entry was posted in System Center Configuration Manger on April 3, 2012 by richardstk.